Students expressed their opinions and learned more about American foreign policy at an anti-war conference on campus last Saturday. 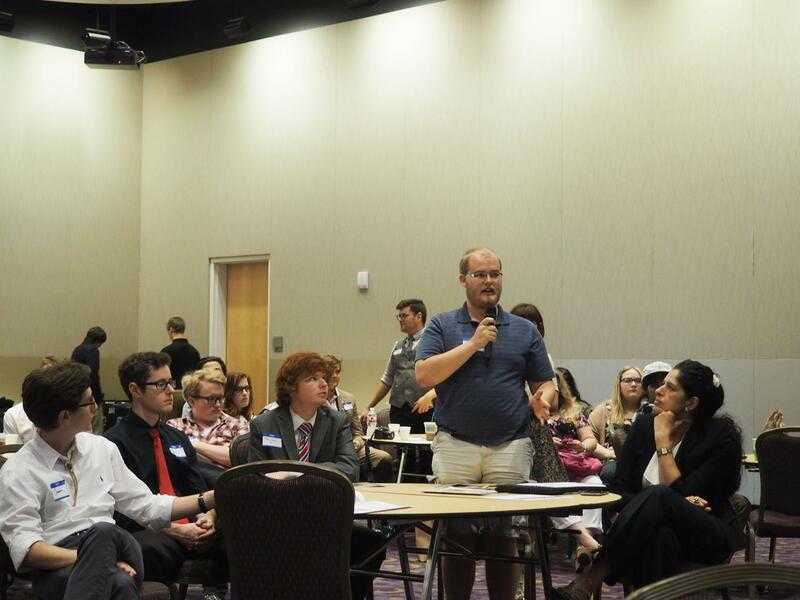 The foreign policy summit was hosted by student organization Liberty at TCU through the Texas Millennial Institute network. Over 100 students attended the summit in the Brown-Lupton University Union Ballroom from 10 a.m. to 6:15 p.m.
Five engaging speakers, including a Syrian refugee and a prominent anti-war radio host, gave talks at the conference. There were also five partner organizations that set up tables and networked with the student attendees. Although more than half of attendees were TCU students, many different schools from Texas and Oklahoma were represented at the conference. A student asked a question to a speaker during the conference. Dustin Lane, the chief operations officer of Texas Millennial Institute, said it was great to have a diverse group of attendees that brought different representations of the topic. “It’s a very young college-oriented mission, and I think that was really the driving force behind the success of the event,” Lane said. The topic of the summit was “Make Conversation, Not War.” Many of the attendants were actively involved in the anti-war movement. Justin Loar, the director of operations for Liberty, said this topic is important for students of this age because they have grown up in a post 9/11 world where war is the norm. SMU student Vanna Ngo said she prefers to think of her ideals as pro-peace rather than anti-war. Speakers such as Scott Horton, an award-winning radio host, and Angela Keaton, director of operations at antiwar.com, shared their stances on specific issues within American foreign policy. The first speaker of the summit, Syrian peace activist Ghada Mukdad, gave an account of what it was like in her Syrian hometown before and during the revolution. Mukdad went into detail about how members of her own family are being displaced due to fighting. She spoke passionately about what she believes needs to be done in order for peace to return to the area. 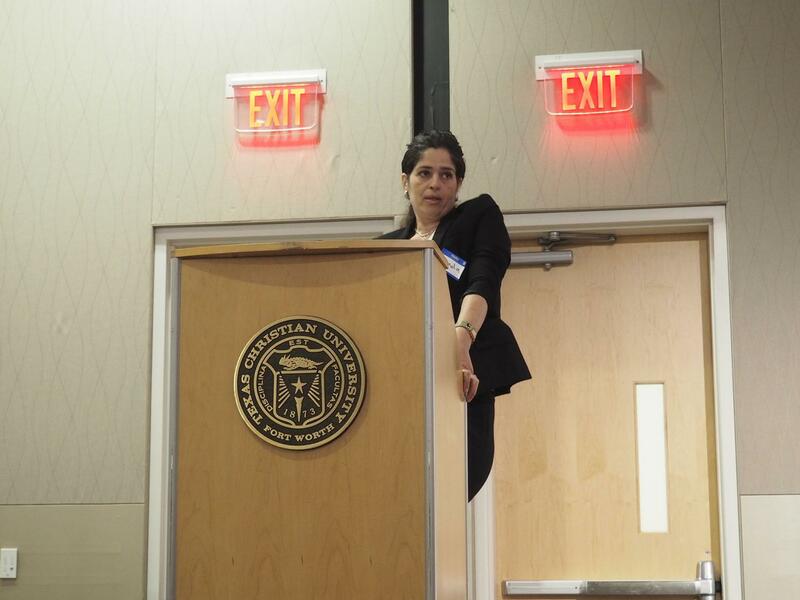 Ghada Mukdad spoke about the current crisis in Syria. Students took charge of the event during the millennial perspectives panel. After being asked about her reasons for being part of the anti-war conversation, panelist Ngo gave an emotional speech about her parents’ escape from Cambodian genocide. The event also provided multiple opportunities for students to share their opinions with one another and interact with the speakers. TCU sophomore biology major Winona Gbedey said her favorite part of the summit was learning more about American involvement in the military of other countries. At the end of the event, Mackenzie Holst, president of Liberty, said the group’s first and incredibly ambitious event greatly exceeded her expectations. Makenzie Stallo is a senior journalism major and French minor from Denton, Texas. She currently serves as a line editor.